★ Limited color until May 2019 ★ It is a blooming knitting chouch that fluffily colors in 3 seconds every day outing. 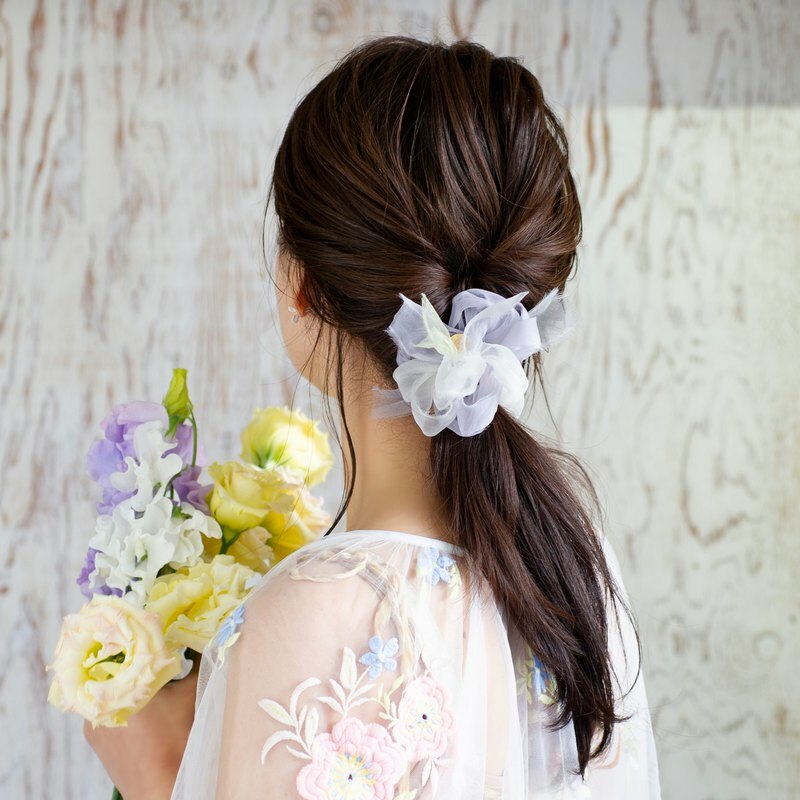 It is a collaboration product with a miscellaneous goods store mini * that loves blooming braided chou. Spring summer with pastel color of manager Cho! There is no doubt that it will be a point of fashion even though it is neat! Mini size without dull color, Let's bloom girly ♡ 【Color】 Ivory × Blue Purple × Lemon The chief of fashionista reflects "now" every time, and it guarantees that you can be a fashion trendy with fashion and seasonal feeling simply by putting on! 2018 Spring limited "Sweet" 2018 Summer limited "Dolphin" ◎ Organza's blooming knitting I split the fabric of the organza and knit a soft flower containing plenty of air. The tattoo is softened by tearing and elasticity is born, and firmly knitting the fabric with Hitohiritsutohari firmly, it creates a fluffy volume. ◎ hair arrangement of mini braided chou shou Because it is knitted in the form of a flower, Brukucho is OK. Just bouncing up quickly, the style that was designed quickly is completed! · One winding lid. Flowers gather a little on top. · Kururin style wrapped in a style. · Before the braid. · To half up. We are proposing styling on various websites and instagrams as well! ◎ I will give you the "just right" for usual outing Organdy through which light escapes is familiar to every day's attire and places to go out. Due to the combination of colors by light, it shows various facial expressions. ◎ blooming knitting chouchu looks delicate and very sturdy Even if it is trained with a train because it is knitted firmly, even if it is put in a pouch it does not go unraveling or unraveling! Even if it gets wet with unfortunate weather, fluffy is as it is. Please do not hesitate to go out! 【Size】 Rubber inner diameter 5.5 cm Fluffy flower part 8 ~ 9cm About 15 cm of the flower maximum including the crispy ribbon ● Custom made products such as color change are accepted at +1000 yen. Please contact us beforehand such as size change, specification change etc! ● Because we have created the organdy cloth ripped, there is a kebadachi. Kebabeba may fall, but as you use it, it becomes difficult for the fibers to fall and fall, so please enjoy enjoying the texture by all means.